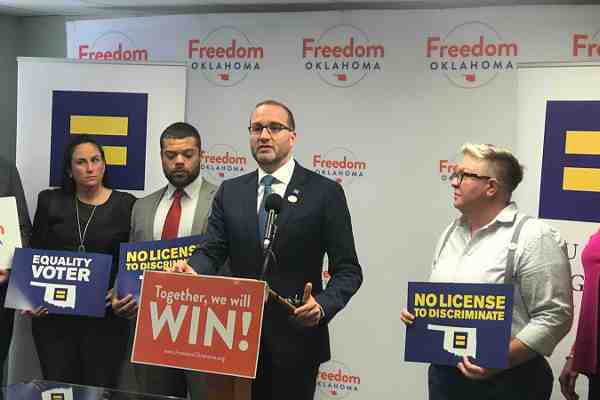 The Human Rights Campaign (HRC), the nation's largest LGBT rights advocate, on Thursday announced that Chad Griffin was stepping down as its president. HRC said that it spent $26 million in a campaign to turn out LGBT voters on November 6. HRC's #TurnOut campaign was focused on voters in Arizona, Michigan, Nevada, Ohio, Pennsylvania and Wisconsin. This year's midterm election returned control of the House to Democrats and dramatically increased the number of openly LGBT elected officials at every level of government. Colorado elected Jared Polis, making him the first openly gay person elected governor, four non-incumbent LGBT candidates won their House races, and Kyrsten Sinema, a Democrat from Arizona, became the first openly bisexual person elected to the Senate, increasing the number of LGBT people in the Senate to two. Griffin previously led the American Foundation for Equal Rights (AFER), the group formed specifically to challenge the constitutionality of Proposition 8, California's voter-approved constitutional amendment which defined marriage as a heterosexual union, putting an end to such unions in California. The lawsuit resulted in the restoration of marriage equality in California. HRC, which was formed in 1980. has annual revenues of roughly $40 million. Griffin was the group's seventh president.